Between hot springs and nature of the Chilean highlands. 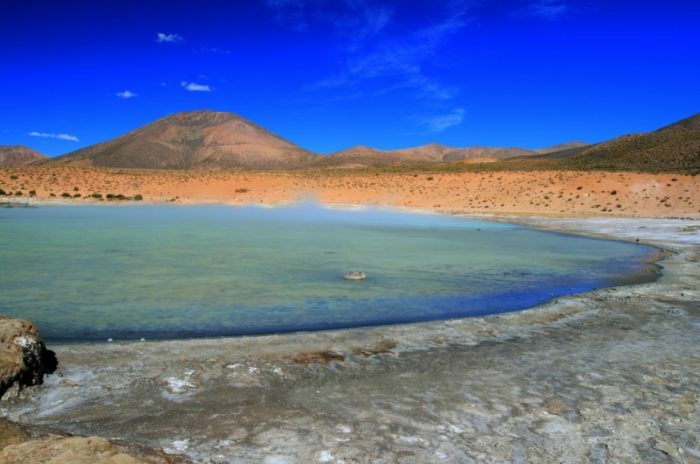 Inserted in the Salar de Surire National Monument, Las Termas de Polloquere, in the northern part of our country, is a mandatory stop for bathing. It has two lagoons with waters that oscillate in 60 ° of temperature, which makes it one of the hottest baths in the country. This, added to its great mineral concentrate, is an instant revitalizer for its visitors. Its surroundings have the largest number of flamingo species in the world, to which are also added foxes, quirquinchos and vicuñas, species that can be observed while taking a bath or hiking around. It is recommended to visit the place during the morning, do not make loud noises that affect the environment and bring enough drinking water to drink. In these hot springs the waters sprout at a temperature of 60ºC and produce a saline coastal lagoon of the salar, which causes its color to be calypso. This bathroom is especially recommended for everything related to rheumatism, lumbar pain and others. However, all can bathe and also observe their surroundings the presence of fauna that the Salar de Surire offers. You can see vicuñas, alpacas, llamas, flamencos and ñandú, an ideal panorama for any photographer. The height and the dryness do not allow a great variety of species of wild flora, nevertheless the own landscape of the Chilean high plateau in conjunction with the thermal baths, they are a Chilean marvel. Undoubtedly if you like the hot springs this is one of the best options in the north of our country.